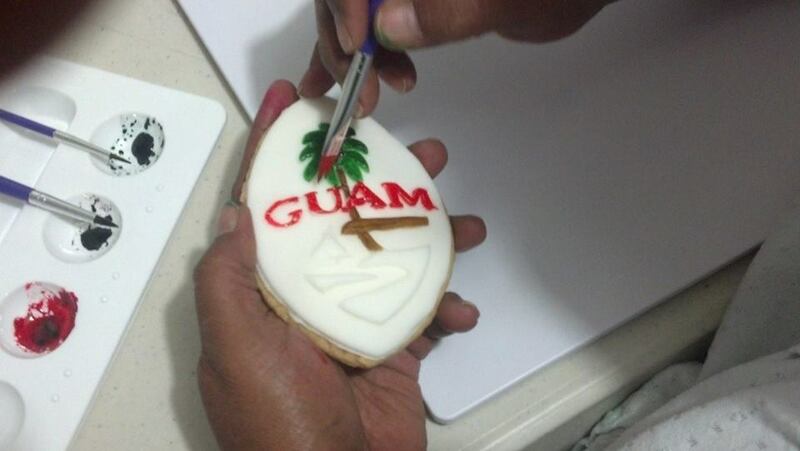 With this Modern Guam Seal Cookie Resin Cutter and Stamp In-One, you are able to easily make beautiful and cultural Guam-themed cookies as party favors, for family, and to give to friends. It effortlessly and simutaneously cuts into dough to create the seal shape, and stamps a beautiful Modern Guam Seal (which is a rendition of Gerard Aflague for his collection). It's a really durable product that will last for many years and might be something that will be handed down to your children, and their children. The coolest thing about this product is not that it is made in the USA, althought that is a great thing! Its that this product is Chamorro inspired, Chamorro designed, hand-crafted, and made by Gerard Aflague for his collection. Mix your favorite rosketti, peanut butter, or butter shortbread recipe. Roll out your dough on a floured table, and stamp and cut your Modern Guam Seal cookies, transfering them to a cookie sheet ready for the baking process. Use your favorite recipe and follow its directions. You may even choose to decorate each cookie with edible paint, colorful icing, or adding other unique embellishments. This product makes 3.5 inch tall cookies, and is made from a resilient food safe and approved material by the Food and Drug Administration (FDA). This product comes with usage and care instructions, with a couple of cookie recipes, including Guam's favorite rosketti, and butter shortbread that work well with our cutter stamp. We use a production process to make our cutter stamps that may introduce random bubbles. This is normal. These bubbles do not affect the relative performance and utility of the product. This product contains: One (1) 3.5 inch tall Modern Guam Seal Cookie Cutter Stamp. Note: The color of the stamp will vary between white and clear. As part of our manufacturing process, there may be minor variations in finish including tiny random bubbles or marbeling streaks. Food-safe and FDA approved material for kitchen use. Cookie Cutter: 3 inches wide x 3.5 inches high x 1/4 inch thick w/flat back-side. It fits perfectly in the palm of your hands when stamping out these cute cookie shapes. 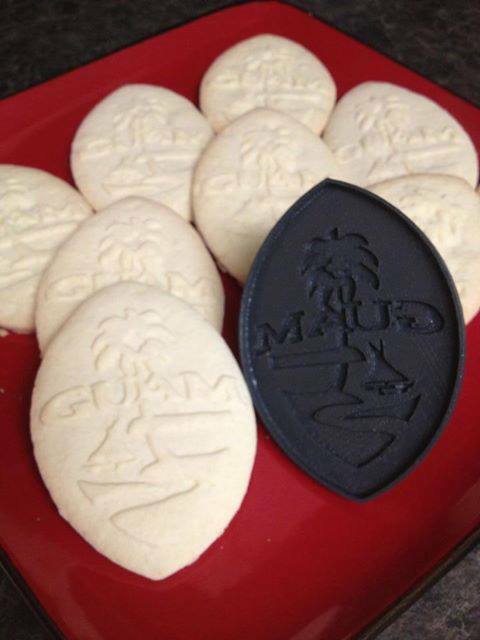 Click the video tab to watch "How to Bake Modern Guam Seal cookies". Below are recipes that we've tried in our kitchen that work well with our Modern Guam Seal Cutter Stamp In-One. You are encouraged to experiment with other cookie recipes avaialble on the internet that may work well with cutter stamps. Hand Blender until mixed well. Roll Small Amounts of dough on floured surface, 1/4 inch thick. Use Wax paper to assist. Dip stamp in bowl of sugar. Press firmly onto dough. Remove Surrounding Edges by hand. Transfer cookies using spatula to ungreased cookie sheet. Chill uncooked dough with cookie sheet in refrigerator for a few hours, or in the freezer for about a half hour. Preheat oven at 320 F, and bake for 16-18 minutes or until edges are golden. Remove from oven, let cool for about 15 mintues (and to let the design deflate). Enjoy! Tip: Try chilling your dough for 2-3 hours, or freezing it for about 15-20 minutes before placing the cut-outs in the oven. It has been suggested that this may reduce the deformation of your cookie shape and provide a cleaner design. 1. Lightly flour the counter surface where you are going to roll your dough. 2. Estimate the depth of the cookie cutter so that your rolled dough is equal to it. Too much dough or too little dough makes your cookie less than ideal. 3. Make sure that you roll your dough to a consistent thickness of about 2/8th of an inch. 4. Spray or brush coconut or other oil onto the face of your stamp before each impression for easy removal and the big reveal! 5. Remove excess dough from the outside perimeter of your stamp, then slowly remove your stamp from the cut-out dough. You may need to carefully help the dough come out of the stamp with your finger or a small tool like a butter knife. 6. Use a flat spatula to transfer your cut-out stamped cookies to your baking sheet. If your spatula is deforming the dough, make sure you used enough flour on the counter, and that you use a thin, flexible spatula. 7. Space your cookies on a cookie sheet. 8. Some people say that placing your cookie sheet in the refrigerator for a few hours, or in the freezer for a half hour prior to baking helps maintain your design. It all depends on the recipe you use and the ingredients that cause your design to change. Experiment, experiment, experiment. We can't say that enough. Your cookie cutter stamp is a first of its kind using 3D technology and a molding process using food-safe resin to make these really cool and durable Modern Guam Seal Cookie Cutter Stamps In-One. We recommend hand-washing and air-drying your resin cookie cutter stamp product before and after each use. In our kitchen lab tests, our cookies turned out with an obvious raised stamp texture. We recommend seasoning your cutter stamp with Pam brand spray prior to each stamping effort, producing a cleaner design on the dough. If any dough gets stuck in the tiny crevices, please use a toothpick to remove any dough that remains prior to restamping. While not all cookie dough recipes work with cutter/stamps, we have tested the recipe below in our kitchen and have found it to work wonderfully. You may find other cutter/stamp recipes on the Internet as well. Like any baking effort, we suggest that you modify your recipes, bake times, and temperatures to come up with your perfect Modern Guam Seal cookies. Baking is a science and art, so keep experimenting. This photo below is an example of how your cookies can look like using a Guam rosketti recipe. It has a great texture to turn out a beautiful design. You can find many Guam rosketti recipes on Facebook's 671 Recipes or by searching Google. If you are disabled in any way and need assistance to place an order over the phone, simply email us at sales@gerardaflaguecollection.com or leave a voicemail message at 703-508-9989 with your name, items of interest, and a return phone number or email address, and we will return contact you at your specified convenience. The photo below shows unfinished rosketti cookies that were made using our cutter stamp. Note how perfect the design turned out. We cannot stress that your experimentation and modification of ingredients can be the factor that makes a beautiful design. This photo below of an iced Modern Guam Seal cookie is an example of how your cookies can look like when you decorate it with all kinds of colorful yummy icing. Note how many colors of red, blue, green, yellow, and brown are used to create a replica of the seal on the Guam flag. 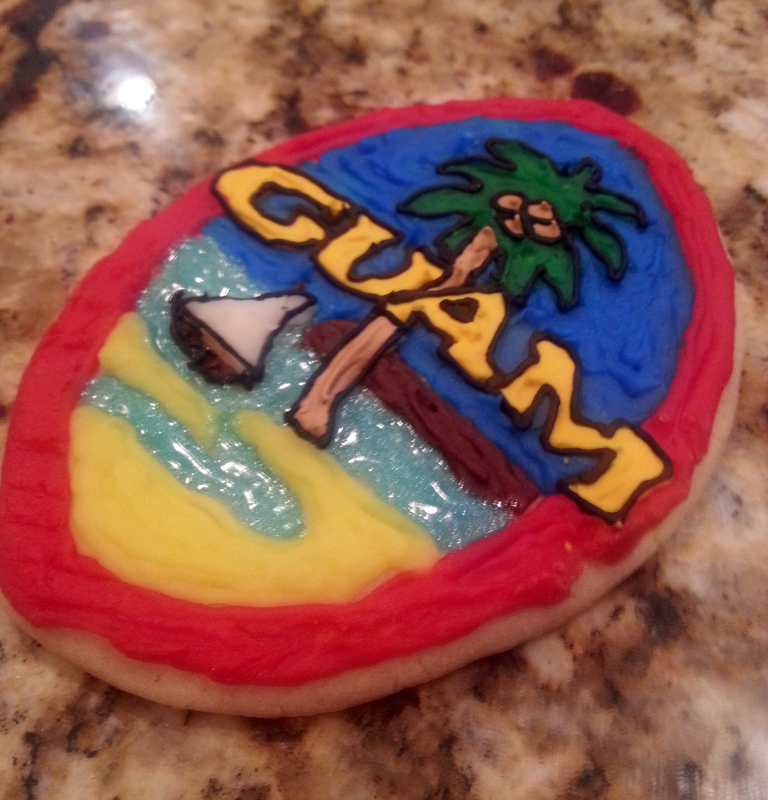 The photo below shows a customer holding a baked Modern Guam Seal cookie, has added white icingi to the top of the cookie, and uses edible paint in several colors with a tiny paintbrush to creatively paint the raised design to reveal a very beautiful cookie for all to enjoy.